What’s the one ship that doesn’t sink? The friendship. But all other ships need routine maintenance to stay afloat. Whether you’ve got a humble tinny or a luxurious bowrider, maintaining your boat is a must if you plan to keep the good times on the water rolling. 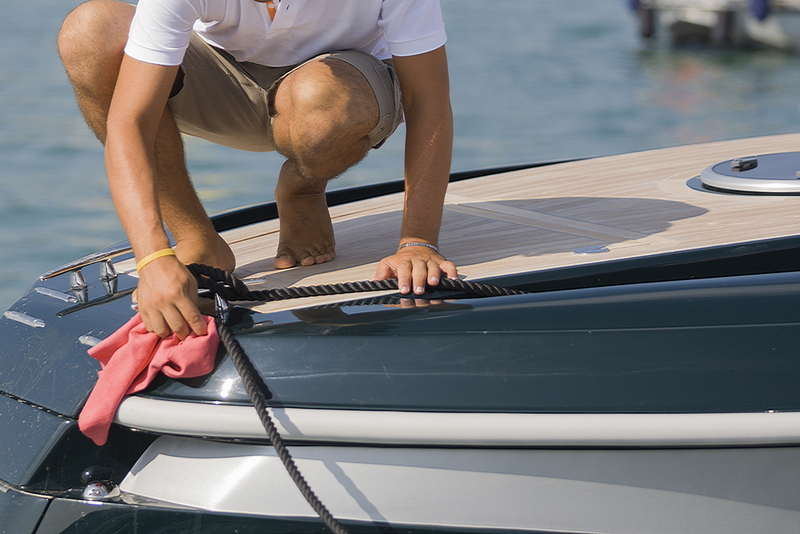 Avoid costly repairs in the long run and get the most out of your favourite vessel by keeping it in top condition. Because no one wants to spend their summer on land like a common peasant. What’s the point of even having a boat if you can’t show it off? Keep yours looking its best with regular cleaning and maintenance. Otherwise your cousin Bill might not be jealous anymore, and where’s the fun in that? If your boat is a regular in saltwater, avoid corrosion caused by salt residue with a good rinse in fresh water. Marine boat wash is ideal for keeping gelcoat boats clean and shiny. If you’ve got some car wash soap handy, that’s the next best thing. Mix with water and use a soft-bristle brush with a long handle to reach every inch. No, not your legs and toenails – we’re still talking about your boat. If you have a gelcoat vessel, the salt and sun can cause that glossy finish to become duller than your cousin Bill’s weekends. Grab yourself a wax to protect and seal your exterior, and a polish to make it shine bright like a diamond. Nothing ruins the luxury of a boat party quite like an unidentifiable stain on the upholstery. Keep your comfy seating clean with regular cleaning. From vacuuming to wiping down with a damp cloth, your method for cleaning will change depending on the materials in your boat. Most boat interiors are upholstered in vinyl, in which case a vinyl cleaner and protectant is necessary to keep it looking fresh. Apparently, unlike paper boat origami, it takes a lot for a real boat to run properly. Be the best darn seaman you can be by keeping your boat’s performance at its peak. Like your car, your boat needs to have its oil changed. The frequency of changes will depend on your model, but generally, once a year or every 100 hours of use is a good rule of thumb. Unlike your car, you can’t just take your boat to a quick-change oil service shop. You have to do it yourself or take it to a dealer. Changing the oil in your boat yourself is pretty simple – just grab some marine grade oil, a wrench, a screwdriver, and a rag, and follow the steps outlined in your vessel’s manufacturer’s guide. One more thing: don’t use car oil for your boat. Your boat works much harder than your car, and only marine grade oil will do. The same goes for coconut oil. We know it’s a ridiculously useful multi-purpose oil, but yes, there is something it can’t do. You know that little spinny thing attached to the motor? It’s really important. Check it’s in place and secure before each launch, and remove it regularly to make sure there’s no fishing line wrapped around the propeller shaft. When fishing line gets caught around your propeller shaft, there’s a chance it can cause gear-case leaks, so make sure you get your dealer to check out your gear-case if you find fishing line where it’s not wanted. If not properly prepared, time off during winter can leave your boat more prone to wear and tear, and more likely to break down. Take these preventative measures to make sure you’re not disappointed by a breakdown come summer time. Cousin Bill would just love that, wouldn’t he? Get your boat in top condition with a thorough clean. Change the gear oil to keep the engine water-free. Remove the battery and store in a dry place. Lubricate all plugs and bulb sockets. Use a boat cover to protect from dust and dirt build-up. Check your manufacturer’s guide for any other storage suggestions (every boat is unique, so yours might need a different tender touch than your neighbour’s does). Another great way to keep your boat in top condition during long periods of non-use is to keep it in storage. National Storage offers clean and secure boat storage, so you can keep your boat safe until the warmer months come back around.